Several things come to mind when thinking of guilty pleasures. Cookies from the dining hall or Netflix on a weeknight are obvious guilty pleasures, but while I shouldn’t eat too many cookies or watch too much Netflix, I’m pretty vocal about my love for both. My true guilty pleasure is far more secret: I love reading tabloids. Tabloids are my guilty pleasure because I could be doing so much more with my time. Studying is one perfect example. Perhaps I could call my family instead. I could even read news of substance and actually educate myself on important things happening around the world. Yet I choose to read tabloids, and perhaps by the end of my argument, you will too. Why tabloids? It’s a question I often ask myself as I read them. As a person who almost exclusively reads classic novels and obsesses over classical music, it seems abnormal for me. But that’s precisely why I need tabloids. Reading the latest gossip, whether it’s true or not, helps me lose some of the stress that’s keeping me up at night. I don’t want to have to think, and tabloids let me avoid that, filling my mind with inane information that I’ll never have to remember or ponder. When you spend all your time trying to understand why your computer code doesn’t work, memorizing 10 different chemical mechanisms, or reading archaic literature that while beautiful and full of meaning is also incomprehensible to the tired student, you start to go a little crazy after a while. Reading about people who are perhaps even crazier is a reminder that you’re not the worst off—and also a reminder to chill for just a moment. Take the Brangelina divorce. Tabloids immediately took hold of that initial true fact and immediately blew it up. And while it’s not really something that affects me, as I struggled with studying for that scary Chem 17 midterm, it was comforting to me that I could catch up on the hilarious theories of Brad Pitt’s infidelity or Jennifer Aniston’s supposed happiness. 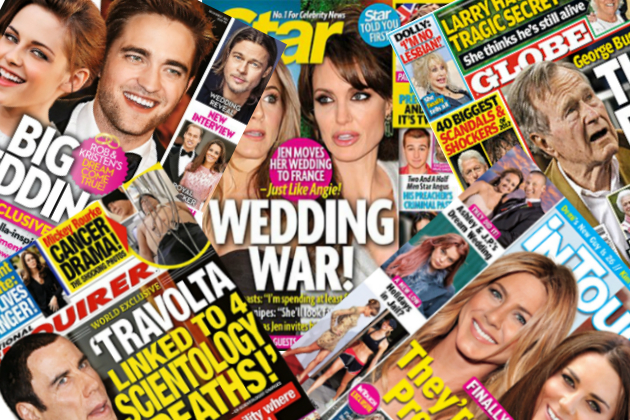 There’s no real evidence that tabloids can actually help with stress. All I can do is speak from experience, and tabloids definitely serve a real purpose in helping me temporarily forget whatever burdens I’m carrying around. After all, when you spend all your time in the search for veritas, isn’t it nice to read some gossip and lies for once? —Staff writer Marianne T. Aguilar can be reached at marianne.aguilar@thecrimson.com.